Definitely a keeper — 18 years after I graduated BC High! Just another day, a day like any other. I pull into the Sunoco station and again lament my car’s dependence on increasingly expensive fossil fuels. I’m also lamenting the $140 bill for the blown break line. But the car is running again and stops when I depress the brake pedal. This is good. The tunes are cranking; the amp is working great and the new Springsteen Live CD was well worth the wait. “State law prohibits the sale of the tobacco to minors. 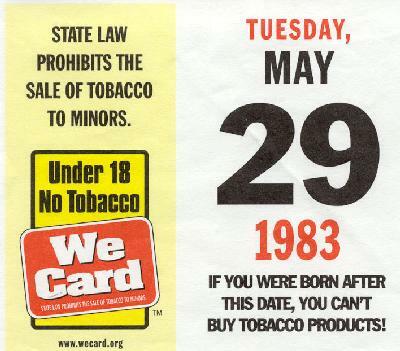 If you were born after this date, you can’t buy tobacco products!” Then I see the Date: May 29, 1983. And a smile hits my face. I ask the clerk for the calendar page and he gives it to me. This one is a keeper. It dawns on me that when I graduated BC High, I was 18. That had been my whole life up to that point. Now 18 more years have passed. Such good memories of four of the best years of my life. I think of the friends I made back then. The friends I still have today. One of the closest, David was in town recently; he and Daria are expecting their second child next month. Driving to work, I think about another milestone— Sister Andrea MacVarish will be 100 in two days. I only met her once or twice as a kid. She was my beloved Nana’s best friend, and I started writing to her after Nana died. Sister Andrea and my Nana grew up together in Glendale Nova Scotia, and I found that writing to her helped me feel closer to Nana. Plus, I think Nana would like that I kept in touch with her dear friend of long ago. Sister Andrea retired around the age of 97 after a lifetime of service, and is still doing remarkably well. I got a short letter from her this week. Her handwriting looks so much like Nana’s. 100 years old. I think about celebrating a century of a life so very well lived. God bless her. I get an email from my sister; our friend Toni and her husband Sean are expecting their first child, and just found out it’s a girl. Her name will be Amber. Another email arrives, from Mom; she has a new Colin story. My nephew, all of almost five, has been asserting his independence more and more, and the other day he muttered, “Dammit.” That brought a stern lecture and I laugh out loud as my Mom explains the dialogue between her and Colin over this new word. I also learn that he’s a ladies man and all the girls love him. At a recent wedding, he danced with his six-year-old friend Beth-Ann and asked her to marry him. The day passes with the usual silliness and chaos but I find myself enjoying it. A call to Sue tells me she’s running late. I have time to hit the gym before she gets home. A swim and a drive home, and the phone is ringing. It’s Sue’s Mom. I’m smiling as I talk to her. Ever since she and Sue found each other after all those years apart, I’m still struck by the miracle of having this wonderful person in our lives. She talks about her farm, the new crop of blueberries (I compliment her on the samples she sent). The pineapples are doing well, she says, but the guava is so-so. She relates a story of helping one of the cows give birth; it was a breach and despite best efforts the baby didn’t survive. She’s trying to keep the mother cow healthy and succeeding. The other babies are doing well, though. And Sammy, the bull, is up to his usual mischief. They finally got some rain over there, too. The crops will do well. Farming is very hard work but it brings her such peace. She calls her land God’s country. I’ve been there—it really is. We’re coming to visit soon, I tell her. No more putting it off. We need to be there. Besides, she makes this amazing marmalade-like jam called “rose hips” that just tastes amazing. I head out to pick up some cases of Coke for work (caffeine=good); the rain is drizzling and the sky is dark, but there’s the sun, peeking through a break in the inky clouds, shining brightly. And I turn and face a perfect rainbow. No, this is not the rainbow I saw that day back in 2001 – this one appeared while we were walking on Wells Beach years later – and this time, I had my camera with me! I stare at this amazing, colorful apparition and it dawns on me that I really should keep my camera in my car. I have to get a picture of this miracle. I bolt into Osco and grab a disposable camera. There’s only one person ahead of me. C’mon, c’mon… The clerk is scanning the items. Beep. Beep. Long pause. Please don’t check the price. Please don’t check the price. I’ve got a rainbow to catch. Dammit, as Colin would say. She’s checking the price. Beep. Hmmm… Beep. C’mon! They don’t have any more clerks here? Beep, beep. Finally it’s my turn. C’mon! Let’s go! Take the money! Yes, it’s a debit card! I already entered the PIN! I race outside. The rainbow is gone. The rain has stopped. I wait a few minutes, staring at the sky. The sun is already setting. No chance of a reappearance. It sure would have been a beautiful picture. “You just bought it,” the clerk says, confused. “I wanted to take a picture of the rainbow,” I explain, feeling like a complete idiot. “It faded.” And besides, I think to myself, sorry Osco, you really need more than one clerk on the registers. So there. She refunds my money, and I head out again. Sue’s home now and we have some dinner. “Charlie’s Angels” is playing on the DVD— it’s a guilty pleasure but a fun movie. I adore Drew Barrymore. Sue tells me about her day. I tell her about mine. She’s getting the flu again. I am once again somehow the cause of her flu despite my own perfect health. Dinner will be stir-fry. And I think about how much I love her. Our dog Benji has his paws wrapped around a rawhide. He’s in Heaven with the thing. I go to pat him and he scootches away. He wants to devote full attention to his snack. Patting will be later, I guess. Today was just another day, a day like any other. My nephew continues to excel, the job is good. My high school graduation was a generation ago, and the memories are all good. I have a cool wife. The families are all okay. Two friends have babies on the way while an old friend celebrates her 100th birthday. I saw a rainbow in the sky tonight. And I really need to keep a camera in my car, the one with the working brakes and the good stereo. Another day with simple joys and little miracles.